The Truth About Fad Diets poster illustrates the truth and fiction about popular diets. It allows you to understand which diets work and which do not. This poster is a great addition to any health or fitness facility. 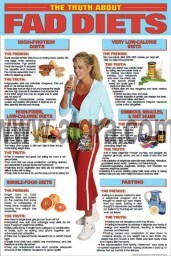 Poster Showing the premise and truth about fad diets. 24" X 36" and 11" x 16" poster available in Paper, Laminated, and Framed.